Rectangular bricks are excellent, but tetrahedrons also tessalate in three dimensions and it ought to be possible to build lots of exciting structures out of tetrahedrons. This technology could be developed to use tessalating, linking, brick shapes based on several tetrahedrons stuck together. This would get around the problem that tetrahedrons don't 'stack' very easily into 'walls' which seems to be what so many people want from their structures now. I forsee a future of buildings with lots of 60 degree angles in them. The Uni in Islington seems similar to this. That's a picture of your aunt? Yep, after wrapping each Toblerone Individually. I did bun this because I'd like to see abit more of this architecture, not much just abit. I'd like an aunt like that! Tetrahedra are not space filling. see link for details. Putting glass in the gaps between the tetrahedrons would look fabulous. I'd love to see a building like that. The interior space would also be an interesting design, assuming the tetrahedron bricks would be left untouched. PS...[freerunner], do you call her "auntie butch?" [xaviergisz] That's an excellent link - and I did mean to use a 'space-filling' shape, so maybe one of the shapes on that link would be better for this idea. + for the concept and for the fact that this type and quality of idea haven't been seen by me any time recently. So throw in one of those other polyhedron form [xaviergisz]'s link that hurt my head. + for the link too. 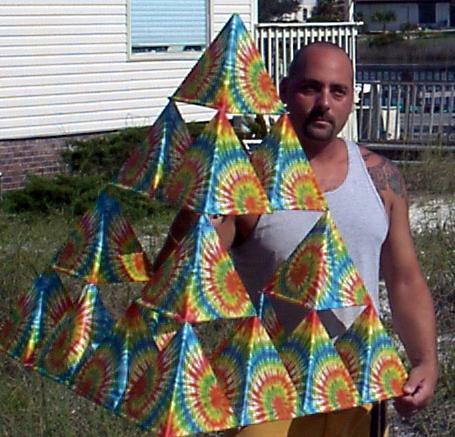 The Serpinski tetrahedron fractal is an interesting form, but I agree with Unabubba. I dont think it is a viable stacking form. Thats not to say that tetrahedrons dont have an application in building design. I'm torn, therefore I dont vote (like 60% of America). Nice idea. An aside: My aunt looks like that. We're Italian (no hope for me).